Andrew Warhola was born in Pittsburgh in 1928. He had a successful career as an illustrator for magazine advertising. He used his skills in advertising to appeal to the general public and make commonplace images such as Soup and Brillo etc works of art. He incorporated photography in to his silk screening techniques. He is also known for his film-making and writing and video installations. Poster France has a wide selection of his works both from during and after his death. His many exhibitions around the world and works for Chanel etc. 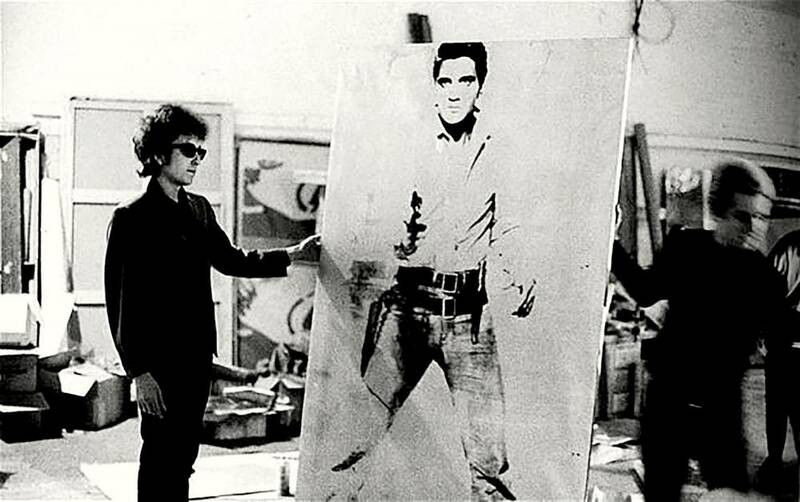 Here is the Silver Elvis by Andy Warhol being admired by Bob Dylan. As it turns out Andy gave Bob this famous painting and Bob ended up giving it away to his manager as he did not care for it. It is worth an astronomical sum today as one of his most important and iconic images.